All our supplements and natural remedies are formulated in small batches to maintain quality and freshness, and manufactured in the U.K. by our parent Company which was founded in 1977 by its present directors with two generations of honesty and commitment. The passion and philosophy of Rainbow Wellbeing is to work with nature in the pursuit of excellence by providing what people need to keep themselves healthy, and to regard ourselves as serving rather than exploiting, a fact well reflected in our price structure. We provide alternative therapy products such as L-Carnosine , Guggul, Colloidal Minerals, Antioxidant Capsules, Antioxidant tablets, Red Yest Rice, Betta Glucan, Propolis, Pollen, Royal Jelly, Serrapeptase, Serratiopetidase, Nattokinase, Q10, Grapessed Extract, Olive Leaf Extract, D-Ribose, Glucosamine , Chondroitin, and Organic Herbs. 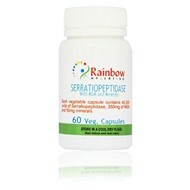 Serrapeptase is used to aid many conditions caused by inflammation, as is also an effective supplement to help cardiovascular help.